Everyone plays as good as the opponent allows to. In this game Levon failed to impress because Sergey was really impressive. White made a new move in a modern line of the Ruy Lopez –15.b3! Perhaps Black had to change his plan, keeping the king on f8. In this case he would have a chance to create some counterplay with his bishops: 15…Bc5 16.Bb2 Bg4!, which would compensate for the weakness of the e5-pawn. However, Aronian played in a more standard way, placing the king to e7, which led to big complications, and eventually lost a pawn. 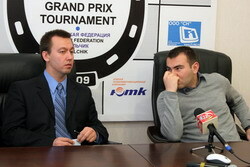 Karjakin converted his advantage in a refined fashion. One cannot pass by the excellent 24.Nb6!, which transposed the game into a rook ending. Soon Black missed his last chance to resist: instead of 27…Rb5 he had to counterattack on the second rank by 27…Rd2!, and then Rb8-e8-e2. In the game White managed to promote his pawn and defended against the perpetual. I found many unexpected resources in the analysis of this complicated game. 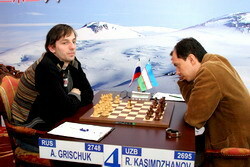 Kasimdzhanov employed a very risky but interesting plan in a well-known variation of the Queen’s Gambit Accepted. I thought that after 14.Nxb6 Black had to take with the c7-pawn, keeping the king’s shelter intact. After 14…cxb6 White cannot retreat the knight from e2 because of the d4-pawn weakness, while 15.Ba4 is well met by 15…g5! with strong counterplay for Black. However, Rustam selected 14…axb6, allowing the opponent to establish deadly-looking pressure against the c6-knight. The ideas behind this move were clarified by the extremely tricky maneuver 17…Qc8! – Black sacrificed a pawn for the initiative. The subsequent moves did not look forced. For instance, instead of 19…fxe5 Black could play 19…Nc6! Later Kasimdzhanov did not find the most accurate 25…Qa6!, which would allow continuing to play on equal terms. After 25…Qb7? Grischuk destroyed Black’s defense by the powerful 26.a4! In the time trouble that followed, the assessment varied from “White wins” to “Black can hold”. On the 39th move White could win by 39.Qe4! with the idea 39…Qg5+ 40.Kh1! Qxd2 41.Qa8#. However, Alexander played 39.Ra2, and Black overstepped the time limit, although he could put up some resistance by 39…Rd8! Now 40.Qe4? Qg5+! loses for White. Of course, even after 39…Rd8 White still has an edge, but the outcome of the game could well be different. The Hungarian grandmaster outskilled the Armenian in opening preparation. In the Meran Variation of the Slav Defense he surprised the opponent with a refined novelty 17…Qd5! Black created strong pressure. In my opinion White had to consider sacrificing an exchange in order to seize the initiative. For instance, it is interesting to look at 21.Bd2! Nb3 22.Rb4 Bxg2! (a fine resource) 23.Bxg2 Nxa1 24.Bc3. Of course, such moves are easier to suggest that actually play on the board. Akopian decided to give up a pawn, and after a few accurate opponent’s moves (23…Ba6!, 26…Qc2!) had to accept a difficult endgame without a pawn, which he failed to hold. Leko’s technique in the final phase of the game was perfect – a textbook example of converting the advantage! A tragic story! At the early phase of the game it looked like the Russian is doomed to fall, however, it was the Ukrainian who perished in the end. In a fashionable line of the Queen’s Gambit Eljanov employed an excellent novelty 12…Qe8! (earlier Black only played 12…b5, allowing the attacking 13.a4!). Alekseev reacted poorly. He couldn’t play 13.Be2 due to 13…Ne4!, but he had to make a preparatory move for the development – 13.Qc2! The move he selected – 13.f3?! – left the White’s king in the center and allowed Black advancing his queenside pawns. Black’s advantage became absolutely clear by the 20th move. I think the most accurate solution was 20…Bd7! In this case Black could prepare the с4-с3 under the perfect circumstances, as White’s most natural defense 21.Nb1 Rfc8! 22.Nc3 (otherwise c4-c3) 22…Nxc3 23.Qxc3 Bxg4! loses a pawn. Pavel wasted a tempo, allowing White to make a useful move – 20...Re8 21.h3, and then started playing on the queenside, which did not make the desired impact. Evgeny defended well, and his bluff 26.h4! shook the opponent’s confidence. Pavel started making mistakes. His 26…Bb5? was a grave error, changing the evaluation dramatically from “almost equal” to “a huge advantage to White”. The advantage was duly converted into a victory. 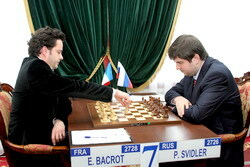 After the move played in the game – 30.Bh6 – Svidler closed all the doors by 30…g5!, and a draw became inevitable. This game was very interesting, and it seems both players conducted it almost perfectly. In the Slav Defense White got the bishop pair, and Black obtained active piece play against the enemy king. I think Ivanchuk incorrectly allowed the Black’s queen to h3. Instead of the rushy 18.e4 I suggest the prophylactic 18.Kg2! – the king can protect himself! After that White has all the chances to prevail in the center. After Black organized the scary setup “Qh3 + Ng4”, White’s advantage evaporated. 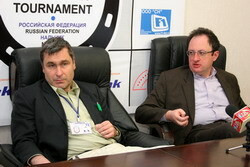 Gelfand masterfully increased tension (21…Be3!, 25…f5! ), and then forced the move repetition by daring cavalry ride 28…Nc1! In the Gruenfeld Defense Black made an interesting novelty, but we did not get a chance to see the depth of Gata’s preparation. The critical line is probably 14.dxc6 followed by trading the queens, however, Shakhriyar reacted in a very tricky fashion. He traded queens in a different way, but failed to get any real advantage. Soon White’s advanced pawns became targets of Black’s counterattack. It was followed by exchange of logical and easy-to-calculate (at the grandmaster level at least) tactical blows that resulted in an equal rook ending, which ended peacefully.